Today it was very hot but gorgious day. So I went to the beach by walking to take pictures. I took this one at the bus stop called "Shirahama Kaigan" on Route 135. Have you ever seen the sea like this? Yes, it is absolutely paradise!!….. This entry was posted in beach on 2007年8月12日 by izusakuraya. Summer! Summer! 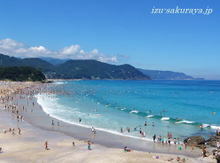 Beautiful Summer in Shimoda!! Today it was really beautiful day in Shimoda. So I finished my job early at noon I went to take picutres by car. I took this picture at "Ogasaki Wing" where you find at first at the entrance of Shimoda city if you come to Shimoda by car on Route 135. 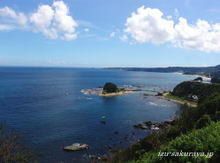 We can see Izu seven island, Suzaki peninsula and Shirahama beach from this spot….. This entry was posted in beach on 2007年8月8日 by izusakuraya.